Use the provided free printable cereal valentine tags to make fun valentines to hand out to the kids in the classroom. 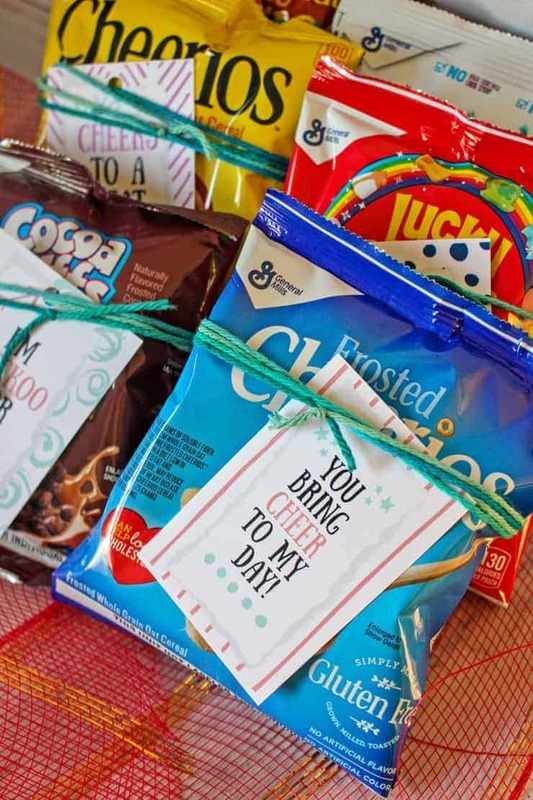 With 8 different cheesy cereal puns, these cute cereal themed valentines are sure to get the kids giggling. Valentine's Day is one of my very favorite holidays. From classmates to grandparents, Valentine's Day is the perfect time for sharing how much we love and appreciate the people in our lives. I like to come up with fun little Valentine's Day gifts to give to the people in our lives. In the past we have made playdough valentines, slime valentines, and even silly string valentines. This year I have a new classroom Valentine idea to share with you — Cereal Valentines! Cereal make the perfect Valentine's Day gift. I mean what kid doesn't love cereal?! 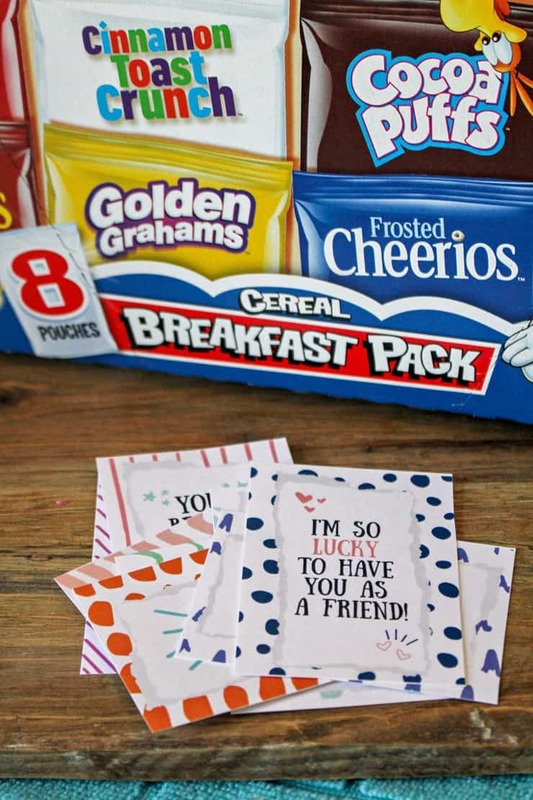 These printable cereal Valentine gift tags come in 8 different styles, each perfect for a different type of cereal. Check out all the “punny” gift tags below. These valentines are very easy to put together, and shouldn't take too much time to make a whole bunch of them for a classroom. We picked up a cereal variety pack that came with an assortment of 8 cereals in cute little bags. By the way, I am so used to these cereal assortments coming in small boxes, when did they start coming in bags? Anyhow, the assortment we picked up comes with all of the cereal varieties that pair with these printable gift tags. However, if you wanted to go a less expensive route, or use just one variety of cereal, you could easily purchase a large box of cereal and then transfer it into individual plastic baggies. Purchasing the single serving bags or boxes may not be cheaper, but it a little bit easier. The choice is yours, and either way will work. Start by downloading and printing out the gift tags on cardstock. Then, use scissors to cut each tag out. Next, punch a hole in the top of each gift tag and thread your yarn through the hole. Just before placing the tag on the bag of cereal, add a piece of double sided tape on the back of the tag to help it stay in place. Finally, wrap the yarn around the cereal bag 2 or 3 times and then tie it in a knot. I hope that you and the kiddos enjoy this fun Valentine idea. If you are looking for non-food Valentine ideas, check out our “You're just ducky” valentine printables. They really are super cute!